Sally Ann IV is the perfect example of a classic, seaworthy Krogen. For those who know that pleasure lies in the voyage as well as the destination she is waiting to take them where ever their heart desires. 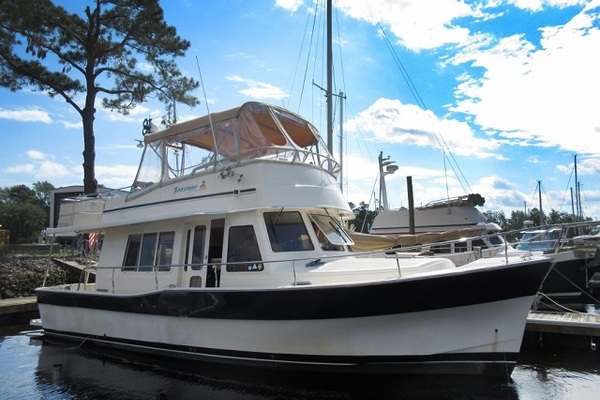 She is a one owner boat so this is a rare chance to be only the second owner of a Krogen 42' with the rare centerline master berth. Feel free to call me anytime to get a run down on her condition and what needs to be done to take you to that distant port of call over the horizon! Hull is fiberglass sandwich construction using closed-cell PVC foam core. Closed-cell PVC foam does not deteriorate or absorb water. Fiberglass schedule uses heavy hand lay-up mat and roving. The composite structure serves both as a buoyancy material and shock, sound and temperature insulator. It rides quiet, increases impact strength and eliminates condensation build-up inside the hull. Decks and superstructure are fiberglass sandwich construction. The Saloon is entered through two teak doors (with screens) off the covered "back porch". To starboard there is a 2 -person sofa with stacking tables beside it. To port there are two comfortable swivel chairs. Two opening and screened side windows with teak valances and curtains and two fixed windows facing aft keep the interior bright and cool. Parquet wood floors are protected by a rug. Entertainment is provided through a 32" smart TV mounted on a stand. There is one 120V/12V wall mounted lamp and one 120V floor lamp. The master stateroom is located forward and features the rare centerline island queen bed. Drawers under the bed and a compartment accessed under the mattress provide a generous amount of storage. A double door hanging locker with shelves, an extra closet forward and a vanity with drawers provide even more storage. There is a large wall mounted mirror with storage cabinet over the vanity. Two deck prisms, a screened opening hatch and opening portholes provide natural ventilation and keep the room light and airy. The Guest stateroom is down three steps from the galley and to the starboard. It features a settee that serves as a berth. Above is a pullman berth on the forward bulkhead with a desk under. There is cabinet and drawer storage as well as a large hanging locker and book shelves. Opening ports and a deck prism provide light and ventilation. The head is located opposite the guest stateroom on the port side. It features a large stall shower with opening port, vanity with medicine cabinet and Raritan electric toilet with Raritan Electra/San type I USCG approved sewage treatment system. There is an aluminum and glass door for the shower. A deck prism brightens the room and the opening ports provide additional light and ventilation. There is ample storage in cabinets and drawers. The pilothouse is up three steps from the saloon. It features an expansive helm area with large windows and a helm chair. Dutch doors to port and starboard and an opening center windshield keep the pilothouse cool while underway. The berth converts to a double bed for guests.